දකුණු ආසියාවේ අඹ වගා කිරීම අවුරුදු දහස් ගණනක් පුරා පැවත ඇත. මේ නිසා අඹ කෙරෙහි දකුණු ආසියාතික සංස්කෘතියේ විශේෂ වැදගත් කමක් පවතී. පිලිපීනයේ ජාතික සංකේතය ද අඹ වෙයි. හින්දු වේදයේ අඹ "food of the gods" ලෙස හැඳින්වෙන අතර හින්දු මංගලෝත්සව හා ආගමික උත්සව අවස්ථා වලදී චාරිත්‍රයක් වශයෙන් අඹ කොළ ශාකමය සැරසිලි ( floral decorations ) සඳහා භාවිතා වේ. මෙම පලතුරෙහි නාමය මලයාලම් භාෂාවේ හා දෙමල භාෂාවේ එන manga යන වචනයෙන් පැවත එයි. පෘතුගීසින් විසින් ඔවුන්ගේ ඉන්දියානු ගවේෂණයෙන් පසු ප්‍රසිද්ධියට පත් වූ නිසා පෘතුගීසි භාෂාවෙහිද manga යන වචනය පවතියි. අඹ ගස්( Mangifera indica )මීටර් 35 - 40 උසක් දක්වා වැඩෙන මීටර් 10 ක් පමණ වූ අරයක් ඇති කිරුළකින් යුත් විශාල ගස් වෙයි.පත්‍ර සෙ.මි. 15 - 35 ක් දිග සෙ.මි. 6 - 16 ක් පළලැති,සරල , එකාන්තරික,සදාහරිත ඒවා වෙයි. ඵල ලපටි අවස්ථාවේදී තැඹිලි-කහ පැහැතිය. පැසිමේදී සිලුටු රතු පැහැයේ සිට තද කොළ පැහැය දක්වා ශීඝ්‍රයෙන් වෙනස් වේ. පුෂ්ප, සෙ.මි. 10 - 40 ක් දිගු අග්‍රස්ත සංයුක්ත එකාක්ෂයක හටගනියි. සෑම සුදු පැහැති කුඩා පුෂ්පයකම මි.මි. 5-10 ක් දිගැති දල/පෙති පහක් ඇත. lily of the valley පුෂ්පයේ වැනි සෞම්‍ය මිහිරි ගන්ධයක් පවතියි. After the flowers finish,ඵල ඉදීමට මාස තුනේ සිට හය අතර කාලයක් ගනියි. අඹ ඵලය අෂ්ටිලයකි. මේරූ විට ගසේ සිට පහළට දිගු නටුවකින් එල්ලී පවතියි. සෙ.මි. 10 - 25 ක් දිගු සෙ.මි. 7 - 12 ක විශ්කම්භයකින් යුක්ත වේ. බර කිලෝ ග්රෑම් 2.5 ක් දක්වා විය හැකි වන අතර ඵල ප්‍රමාණයෙන් විවිධ වෙයි.ඉදුණු ඵලය කහ,තැඹිලි හා රතු යන විවිධ වර්ණ වලින් යුක්තය. සුර්යාලෝකය පතනය වන මුහුණත වඩාත් රතු පහන් යුක්ත අතර අඳුරේ පවතින මුහුණත කහ පැහැති වෙයි. කොළ පැහැය සාමාන්‍යයෙන් ඉදී නොමැති බව දැක්වුවද මෙය අඹ ප්‍රභේදය මත වෙනස් වේ. ඉදුණු විට, පොතු ඉවත් නොකරන ලද ඵලයෙන් විශේෂ රෙසීනමය යන්තම් මිහිරි ගන්ධයක් විහිදෙයි.ඵලය මධ්‍යයෙහි තනි, පැතලි, දිගටි බීජයකි. ප්‍රභේදය අනුව මෙහි මතුපිට තන්තු සහිත හෝ තන්තු රහිත විය හැක. මි.මි. 1 - 2 ක් ඝනකමැති කබොල්ලට ඇතුලතින් කඩදාසියක් තරම් තුනී අතුරුණුවකින්/lining වටවූ සෙ.මි. 4 - 7 දිගැති, සෙ.මි. 3 - 4 පළලැති, සෙ.මි. 1 ඝනකමැති තනි බීජයක් පවතියි. වර්තමානයේදී අඹ හිම පතනය නොවන උණුසුම් උප නිවර්තන දේශගුණයක් සහිත ඉන්දියානු අර්ධද්වීපය,දකුණු පකිස්තානය ,උතුරු,දකුණු සහ මධ්‍යම ඇමෙරිකාව,කැරිබියානු දුපත්,දකුණු හා මධ්‍යම අප්‍රිකාව, ඔස්ට්‍රේලියාව සහ ගිනිකොනදිග ආසියාව යන ප්‍රදේශ වල පළතුරක් වශයෙන් බහුල ලෙස වගාකරයි. අඹ පහසුවෙන් වගාකළ හැක.දැනට ටර්පන්ටයින් අඹ(පවතින සැර ටර්පන්ටයින් රසයට අනුව ,Oxford Companion to Food විශ්වකෝෂයට අනුව ඇතැම් වර්ග වල සත්‍යවශයෙන්ම අඩංගුය) , ඇටඹ ,... ආදී වූ අඹ ප්‍රභේද 1,000 කට අධික ප්‍රමාණයක් ඇත.අඹ, ලොව පුරා පිසීමකින් තොරව ආහාරයට ගන්නා පලතුරු අතරින් බහුලවම ආහාරයට ගන්නා පලතුර ලෙස ප්‍රකටය.. නිවර්තන දේශගුනයන්හි දී අඹ පහසුවෙන් දේශානුකුලනය වේ.හවායි දුපත් හි ඇති ඇතැම් පහත් බිම් වනාන්තර වල හඳුන්වාදුන් අඹ විශේෂ ප්‍රමුඛ වී ඇත. දකුණු ෆ්ලොරිඩාවෙහි අඹ වගා නොකරතත් එය ගෙවතු වල පලතුරු ශාකයක් ලෙස බහුලව දැකිය හැක. අඹ ලොව පුරා ජනයා අතර ජනප්‍රිය වූ පලතුරක් වුවත් බොහෝ අඹ වගාකරුවන්ට තම අස්වැන්න සඳහා ලැබෙනුයේ අඩු මිලකි.This has led to අඹ being available as a 'fair trade' item in some countries. There is a unique pigment that cannot be synthesized called euxanthin or euxanthine, and usually known as Indian Yellow, which is produced in the urine of cows fed on අඹ leaves. Their urine was once collected and evaporated and the pigment then used in oil paint. The practice was outlawed in 1908 due to malnutrition of the cows (the leaves have a mildly toxic substance related to that in poison ivy) and the color is now produced synthetically by mixing other pigments. ඉදුණු අඹ ඵලයෙහි මාංශල කොටසෙහි සීනි 15% ක් ද 1% ක් දක්වා ප්‍රෝටීන් ද විටමින් A,B සහ C සැලකිය යුතු ප්‍රමාණයක් ද පවතියි.මෙම පලතුර මිහිරි රසයක් ඇත. ඇතැම් ප්‍රභේද පීච් සහ අන්නාසි අතරමැදි රසයක් සහිත අම්ලමය රසයකින් යුක්තය.මාංශල කොටසෙහි වයනය ප්‍රභේදයෙන් ප්‍රභේදයට පැහැදිලිව වෙනස් වෙයි. ඇතැම්වාහි වැඩියෙන් ඉදුණු ප්ලම් ගෙඩියක් මෙන් මෘදු පල්පමය වයනයක් පවතියි. ඇතැම් ප්‍රභේදවල මාංශය කැන්ටලොප්(කොමඩු වැනි පලතුරකි) හෝ අලිගැටපේර මෙන් දැඩි වන අතර ඇතැම්වා හි මාංශල කොටසෙහි කෙඳිතිමය වයනයක් පවතියි.අඹ ඉහල ජල ප්‍රමානයක් අඩංගු වන යුෂ අධික මිහිරි පලතුරකි.මෙනිසා තරමක් අපිලිවෙල සහගත වුව ද අඹ ප්‍රබොධමත් කරන ආහාරයකි. අඹ චට්නි සැදිමෙ දි බහුලව යොදා ගැනෙයි.චට්නි, බටහිර රටවල පැණිරසැති ලෙසද ඉන්දියානු උප මහාද්වීපයෙහි රටවල දෙහි හා මිරිස් යොදා තියුණු රසයකින් යුක්තවද සාදනු ලබන ආහාරයකි.ඉන්දියාවෙහි පැසුණු අඹ සිහින් ස්ථර වලට කපා , වියළා , නමා නැවතත් කපා , පිය හැකි තීරු ලෙස විකුණනු ලැබේ.These bars, known as amavat or halva in Hindi කොලොම්බියාවේ විකුණනු ලබන වියලි පේර තීරු වලට මේවා සමාන වෙයි. නොමේරු අඹ ලුණු සමඟ ආහාරයට ගැනීමට බොහෝ දෙනා ප්‍රිය කරයි. මේවා ලෙමන් වලටත් වඩා අතිශය ඇඹුල් රසැතිය. උෂ්ණාධික ලෙස ආහාර පිළියෙළ කරනා ප්‍රදේශ වල අමු අඹ ලුණු හා මිරිස් සමඟ ආහාරයට ගනී. ඇමෙරිකානු සමාජයේ බොහෝ දෙනා අඹ ලෙලි ආහාරයට ගැනීම ප්‍රිය කරයි. මක්නිසාද යත් එහි කැල්සියම් හා විටමින් B6 යහමින් අඩංගු වෙයි. අඹ පලතුර විවිධ මාෂමය නිෂ්පාදන වලදී ප්‍රධාන සන්ගටකයක් ලෙස භාවිතා කරයි. විශේෂයෙන්ම muesli හා oat granola වලදී. In the Philippines, unripe අඹ is eaten with bagoong. Dried strips of sweet, ripe අඹ have also gained popularity both inside and outside the country, with those produced in Cebu making it to export markets around the world. In other parts of South-east Asia, අඹ are very popular pickled with fish sauce and rice vinegar. අඹ යුෂ, ඉදුණු අඹ වලින් මෙන්ම නොඉදුණු අඹ වලින්ද සාදනු ලැබෙයි . අඹ කැබලි පොඩි කර අයිස් ක්‍රීම් වල යෙදිය හැක. අඹ වලින් "පයි" ද සාදනු ලැබෙයි. කිරි, සීනි හා කුඩු කල අයිස් සමග අඹ හොඳින් මිශ්‍ර කර නැවුම් පානයක් සාදා ගත හැක.වඩාත් සාම්ප්‍රදායික ඉන්දියානු පානයකි අඹ lassi . මෙය බොහෝදුරට සාමාන්‍ය අඹ පානයකට සමාන වන නමුත් යෝගට් හා කිරි මිශ්‍රණයක් මුලික වශයෙන් භාවිතා වෙයි. ඇතැම් විට ලුණු හෝ එනසාල් රසකාරක ලෙස භාවිතා කරයි. තායිලන්තය හා අනෙක් ගිණිකොනදිග ආසියාතික රටවල පැණි රසැති ඇලෙන සුළු බත් හා පොල් මත කපන ලද අඹ තීරු තබා අතුරුපස ලෙස ආහාරයට ගනියි. "Mango Shake" or "Mangoshake" is a refreshing Punjabi (Indian/Pakistani) summer drink. It is traditionally made of අඹ pulp, whole milk, සීනි and ice cubes. However there are various other ingredients which are sometimes added, such as ice cream, fresh fruit, chocolate sauce and other sauces, along with whipped cream. It is very similar to a milkshake which can be consumed with a spoon. Dried unripe අඹ used as a spice in India is known as amchur (sometimes spelled amchoor). Am is a Hindi word for අඹ and amchoor is nothing but powder or extract of අඹ. Note: The Sweet Bell Pepper (capsicum) was once known as අඹ in parts of the midwestern United States  With the advent of fresh fruit importers exposing individuals to the tropical fruit, the colloquial use of this alternative name for the Sweet Bell Pepper has become archaic, although occasionally midwestern menus will still offer stuffed අඹ as an entree. 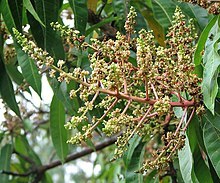 The අඹ is in the same family as poison ivy and contains urushiol, though much less than poison ivy. Some people get dermatitis from touching අඹ peel or sap. Persons showing an allergic reaction after handling a අඹ can usually enjoy the fruit if someone else first removes the skin. The leaves are toxic to cattle. හින්දූන් විසින් අඹ පත්‍ර හෘහයන්හි දොරකඩ සැරසීමට හා ඉන්දියානු පූජාවන්හි දී භාවිතා කරයි. ඉන්දියානු රෙදිපිළි වල මෝස්‌තර අංගයක් ලෙස ද අඹ භාවිතා වෙයි., known as the paisley design. ඉන්දියාව විශාලතම අඹ නිෂ්පාදකයා වන අතර වර්ග කිලෝමීටර 16,000 භූමික අඹ වගාකර වාර්ෂිකව ටොන් මිලියන 10.8 ක අඹ අස්වැන්නක් නිෂ්පාදනය කරයි. එය සමස්ත ලෝක අඹ නිෂ්පාදනයෙන් 57.18% කි. ඉන්දියාව තුල, දකුණුදිග ආන්ද්‍රා ප්‍රදේශයේ වැඩිම අඹ නිෂ්පානයක් සිදුකරන අතර එහි හෙක්ටයාර 350,000 ක අඹ වගාකර ඇත (2004 දත්ත). Langra and Himsagar are considered as the two most superior type of අඹ in India. Both of these varieties are produced in East and North India, especially in Uttar Pradesh state. The main production of Langra happens in a small town of West Bengal, Malda. Both of these varieties are not suitable for long preservation and thus not suitable for transport to long distances or export. The variety 'Alphanso', although taste-wise not as superior as langra and himsagar, but can be preserved longer. So this has become the අඹ that is generally used for export. Alphanso is named after Afonso De Albuquerque. This was an exquisite and expensive variety of අඹ, that he used to bring on his journeys to Goa. The locals took to calling it Aphoos in Konkani and in Maharashtra the pronunciation got further corrupted to Hapoos. This variety then was taken to the Konkan region of Maharashtra and other parts of India. Banginapalli from Andhra Pradesh, Ratnagiri and Devgad Hapoos from Maharashtra are among the most prized varieties in south India. Lucknow and Varanasi අඹ are prized in the north of the country, where Uttar Pradesh state dominates the production tables. Certain අඹ varieties are picked raw and turned into spicy pickles. Andhra Pradesh and Karnataka states in the south, and Gujarat and Uttar Pradesh in the north are major producers of pickle-variety අඹ and specialize in making a variety of අඹ pickles. These pickles can be very spicy, and tend to have large regional differences in taste. Generally, once ripe, අඹ are quite juicy and can be very messy to eat. However, those exported to temperate regions are, like most tropical fruit, picked under-ripe. Although they are ethylene producers and ripen in transit, they do not have the same juiciness or flavour as the fresh fruit. A ripe අඹ will have an orange-yellow or reddish skin. To allow a අඹ to continue to ripen after purchase, it should be stored in a cool, dark place, but not in a refrigerator as this will slow the ripening process. Ripe අඹ are extremely popular throughout Latin America. In Mexico, sliced අඹ is eaten with chili powder and/or salt. Street vendors sometimes sell whole අඹ on a stick, dipped in the chili-salt mixture. In ඉන්දුනීසියාව, green අඹ is sold by street vendors with sugar and salt and/or chili. Green අඹ may be used in the sour salad called rujak in Indonesia, and rojak in Malaysia and Singapore. In Guatemala, Ecuador, Nicaragua and Honduras, small, green අඹ are popular; they have a sharp, brisk flavour like a Granny Smith apple. Vendors sell slices of peeled green අඹ on the streets of these countries, often served with salt. In Hawai'i it is common to pickle green අඹ slices. Ayurveda considers ripe අඹ sweet and heating, balancing all the three doshas(humors) and acts as an energizer. Raw අඹ are used in making pickles and condiments due to its peculiar sweet and sour taste. Dried and powdered raw අඹ is sometimes also used as a condiment in Indian cuisine. නම් කරන ලද අඹ ප්‍රභේද බොහෝ ගණනනක් පවතියි. බොහෝ අඹ වතු වල මුහුම් පරාගනය(cross-pollination) වැඩි දියුණු කිරීමට ප්‍රභේද මිශ්‍ර කරයි.In Maharashtra, the most common cultivar is 'Alphonso' (known in Asia under the original name, Hapoos). 'Alphonso' is very popular outside Indian subcontinent and one of the important export product of India. The best 'Alphonso' අඹ are reputed to come from the town of Ratnagiri and Devgad in Maharashtra. In Uttar Pradesh, 'Dasheri' from Lucknow is famous for its aroma, and is so tasty that even the skin can be eaten. 'Langada' from Varanasi in eastern UP is another variety which is extremely sought after for its fine flavour and aroma. Actually it is believed that the Langda is even better than the 'Alphonso', but is not suitable for export because of the perishable nature. Hence 'Alphonso' is more common outside India. 'Banganapalli' (also called 'Banesha' or 'Began Phali') of Andhra Pradesh is one of the most sought after cultivars. Maldah is one of the most sought after cultivars in Bihar. Notably, cultivars which excel in one climate fail to achieve their potential in other climates. Thus the cultivar 'Julie', a Jamaican favourite, and 'Alphonso' have never found great success in South Florida, Israel or Australia. Currently, the world market is dominated by the cultivar 'Tommy Atkins', a seedling of 'Haden' which first fruited in 1940 in Southern Florida, USA. Despite being initially rejected commercially by Florida researchers[තහවුරු කරන්න], 'Tommy Atkins' quickly became an export favourite worldwide. For example, 80% of අඹ in UK supermarkets are 'Tommy Atkins'. Despite its fibrous flesh and fair taste, growers world-wide have embraced the cultivar for its exceptional production and disease resistance, the shelf-life of its fruit, their transportability as well as their size and beautiful color. 'Tommy Atkins' is predominant in the USA as well, although other cultivars, such 'Kent', 'Keitt', the Haitian grown 'Madame Francis' and the Mexican grown 'Champagne' are widely available. A list of additional leading cultivars can be found at the cultivar list link in the external links below. SAJAforum.org on historic arrival of Indian අඹ to the U.S.
මේ පිටුව අන්තිමට සැකසුවේ 4 අප්‍රේල් 2015 දින දී, 16:39 වේලාවෙහිදීය.